REGINA, Feb. 7, 2017 /CNW/ - Input Capital Corp. ("Input" or the "Company") (TSX Venture: INP) (US: INPCF) has released its results for the first quarter of its 2017 fiscal year. All figures are presented in Canadian dollars. "The first quarter of 2017 is marked by a significant increase in capital deployment compared to last year," said President and CEO Doug Emsley. "During the quarter, Input deployed $12.6 million into seventeen streaming contracts, a 90% increase over the same period last year. Our prospect pipeline is also larger than it has ever been, due to the success of several recent farm trade shows." 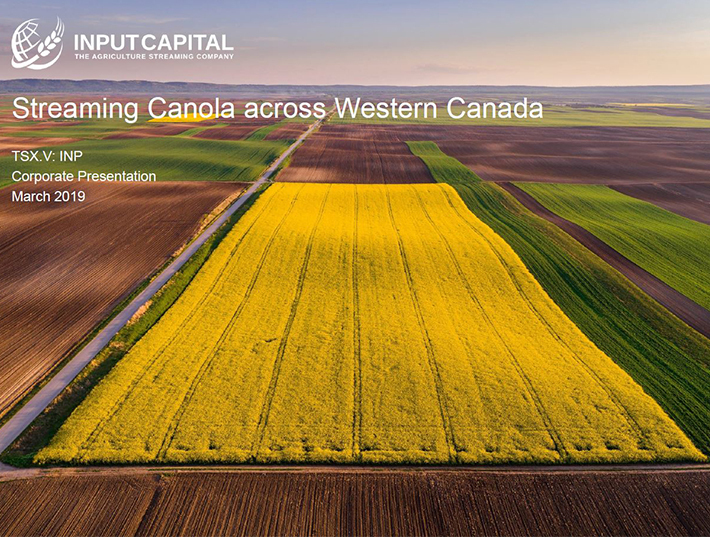 "During the quarter, we also sold 24,958 MT of canola in spite of weather-related delays to harvest activity in October, and initiated a quarterly dividend. We are well on track for a successful canola sales season with most of our canola expected to be sold by the end of the second quarter. We also have a conditional sale in place on a significant portion of the farmland held for sale and look forward to being able to confirm this sale and other similar asset sales in the near future." Signed an agreement for the sale of farmland that was previously received from a farmer as a partial buydown of a streaming contract. The sale remains subject to the removal of certain conditions and is scheduled to close on April 1, 2017. * An early harvest accompanied by very rapid and efficient canola deliveries during the three months ended December 31, 2015 inflated canola sales during that period relative to Management's normal expectations. The proportion of 2016 production sold during the period ended December 31, 2016 is more in keeping with Management's expectations for normal years. For the three months ended December 31, 2016, Input generated adjusted sales1 from streaming contracts of $11.724 million on the adjusted streaming volume1 of 24,958 MT an average price of $470 per MT, slightly below the average Prairie cash canola price of $472 during the quarter. Input's average price is expected to rise in Q2 as canola sales are realized at contracted higher prices. Adjusted streaming sales decreased by 25% compared to the comparable quarter one year ago, when the Company sold 31,889 MT of canola equivalent. The high numbers last year are the result of unusually rapid canola movement during the 2015 harvest as well as carry-in volume from the 2014 harvest that was not able to be sold previously. Supplementing the Company's marketing and logistics plan for streaming tonnes, Input generated revenue from canola trading during the quarter of $1.585 million compared to $6.973 million in the comparable quarter one year ago. Trading revenues are subject to fluctuations and generate low margins. They are often a result of filling gaps in the Company's streaming contract marketing program to optimize deliveries. During the comparable three month period ended December 31, 2015, Input added two new contracts to its portfolio. Input has taken deliberate steps to add a larger number of smaller contracts to its portfolio of streaming contracts and is pleased to have added more than four times the number of new producers in the period this year as it did in the comparable period last year. As of December 31, 2016, Input's active streaming portfolio consisted of 121 geographically diversified streams. 95 of the Company's canola streams are with farms in Saskatchewan, 20 are located in Alberta, and 6 are in Manitoba. While the 2016 growing season featured a slow harvest which delayed some canola sales from Q1 into Q2 of the current fiscal year, management is pleased with the progress of sales from its overall program and expects the majority of canola contracted from the 2016 crop to be sold by the end of Q2. Input's collection efforts with regard to three terminated streaming contracts continue. Approximately $11.8 million of the original $18.4 million has been collected to date and management believes the full amount outstanding will be collected in due course. Input is a secured creditor, and the collection and land sale processes associated with these funds continues to proceed as expected. Input's capital deployment program is yielding good results in the aftermath of two very successful trade shows in early January. The prospect pipeline is larger than ever, and the Regional Account Manager team is busy meeting with farmers to follow up on their expressed interest in canola streaming. Market expectations for high canola seeded acres this year are indicative of high farmer interest in producing canola, which can be quite profitable at current prices. However, canola is also input intensive, providing an excellent opportunity for the Company to partner with farmers via streaming contracts. Management remains confident in its goal of deploying $50 million into new streaming deals during this fiscal year. 2 Includes contracts that were signed but not completely funded at the end of the quarter ended December 31, 2016.